Many of the Green Ash trees, Fraxinus pennsylvanica are dying in Perry, Ohio – Lake County. Why? Green ash is popular as a shade tree in residential areas because of its good form and adaptability to a wide range of sites. It is susceptible to Emerald Ash borer, an invasive species. Emerald ash borer (EAB), Agrilus planipennis Fairmaire, is an exotic beetle that was discovered in southeastern Michigan near Detroit in the summer of 2002. The adult beetles nibble on ash foliage but cause little damage. disrupting the tree's ability to transport water and nutrients. and ‘blonding’, which is large portions of bark that fall off the tree reveal a patch of wood that looks ‘blond’ in color. A tree that shows severe infestation will die within the year. The danger is these trees soon become a fall hazard and need to be removed before injury or property damage occurs. It is recommended that you hire a tree removal service that is ISA certified and/or bonded. 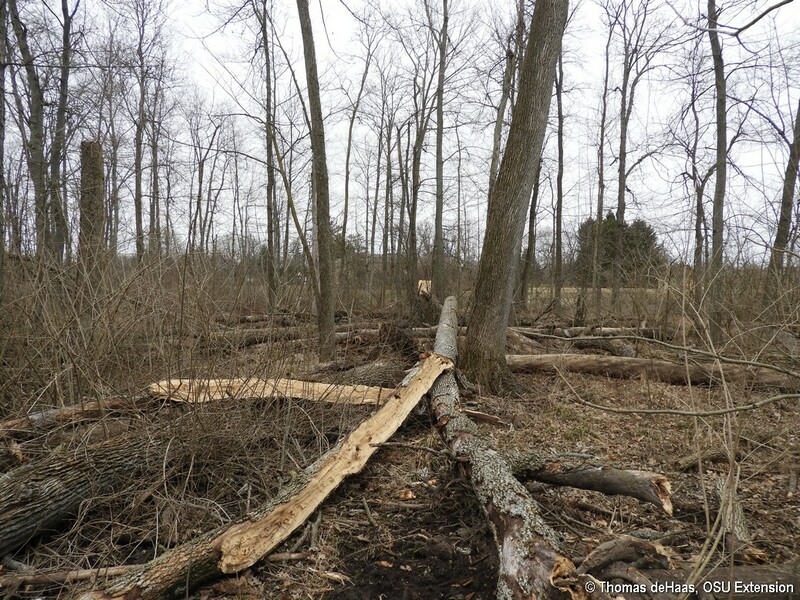 Now that the Emerald Ash Borer has infested Lake County, Ohio, many Green Ash trees in the landscape and forest woodlots have died. But the real danger is right overhead. With dead trees and wind combinded, it can be a costly and deadly combination. A tree that shows severe infestation will die within the year. The danger is these trees soon become a fall hazard and need to be removed before injury or property damage occurs. Our understanding of how EAB can be managed successfully with insecticides has advanced since this bulletin was initially published in 2009. This version has been revised to address frequently asked questions and reflect the current state of understanding of insecticide options for controlling EAB and their effectiveness. It is important to note that research is an ongoing process. Scientists from universities, government agencies, and companies will continue to make discoveries and advance EAB management and ash conservation.